I was in Dubai recently as part of the Healthcare UK team attending Arab Health.This annual exhibition, which celebrated its 40th year of existence, seems to have grown at a pace almost as rapid as the city’s skyline. This was my first experience of what I am told is the second largest specialist healthcare and medical technology exhibition in the world after Medica in Dusseldorf. On last week’s evidence, I doubt it will be long before Arab Health surpasses even Medica in numbers. The total footfall last week was said to be close to 100,000. I can vouch for the serious numbers, having tripped over about 250 trolley bags being driven by enthusiastic attendees. The United Kingdom was there in force. Earl Howe, Parliamentary Under-Secretary at the Dept of Health, and Lord Kakkar, Business Ambassador for Healthcare, led the UK delegation, which also comprised Howard Lyons, Managing Director of Healthcare UK and a number of Healthcare UK colleagues. We were given sterling support by the British Embassy and UK Trade & Investment’s in-country healthcare team, particularly Sally Heath. In addition to official government representation, there were almost 200 UK companies exhibiting, many under the umbrella of the Association of British Healthcare Industries (ABHI) or with one of the Devolved Administrations of Scotland, Northern Ireland and Wales. 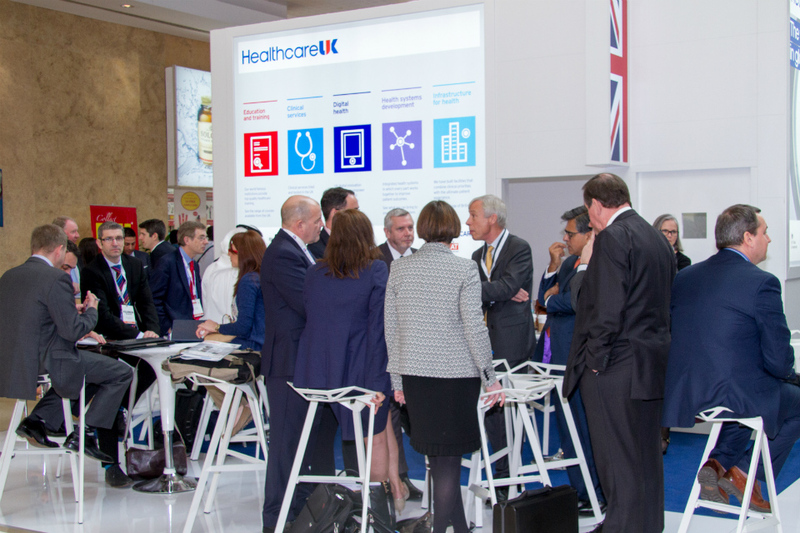 Although the UK pavilion was some distance from Healthcare UK’s stand, there was plenty of activity between the two and good co-ordination to ensure that useful meetings were held in the margins. 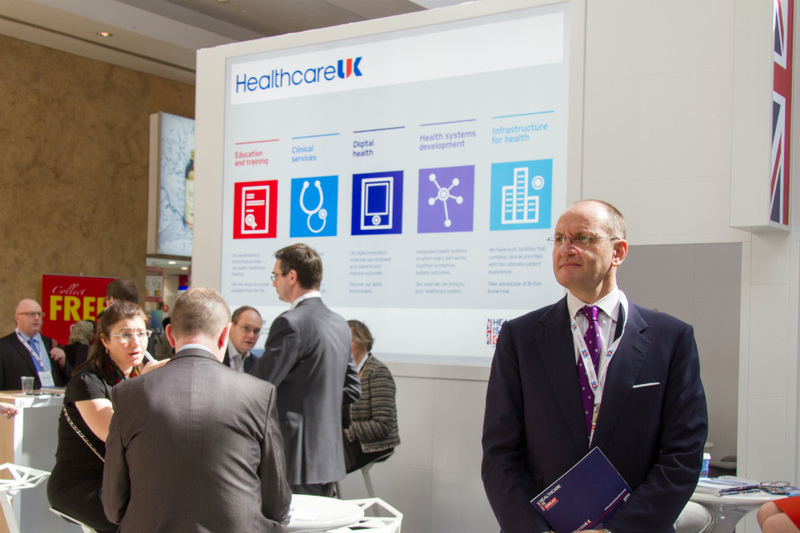 It is for others to judge whether the Healthcare UK stand, and indeed our large presence, made a big impact on Arab Health, but the excellent location (on the main concourse), the brightly displayed UK propositions and the new literature went down well with customers and stakeholders alike – see photo above. There was also intensive activity away from the exhibition, with meetings on the sidelines, set-piece events, receptions and seminars. All of these provided excellent networking opportunitiesthe and I almost exhausted my supply of 250 business cards in three days of frenetic activity. Aside from helping colleagues on the stand and networking, my main focus was on two workshops that Healthcare UK had organised at Dubai Healthcare City to discuss two of the UK’s main five propositions: Education & Training and Delivering High Quality Clinical Services. These were an opportunity to meet with senior Emirati colleagues representing the regulators, medical cities and public and private organisations to discuss UK expertise and how we might partner the UAE in healthcare delivery locally. The workshops benefited not only from excellent speakers, but from attendance by a wide array of UK entities representing some of our leading institutions, including Bart’s, Great Ormond Street, UCL, EY, Serco, TPP and Yorkshire & Humber AHSN to name just a few. The open and productive discussions enabled both sides to deepen our shared understanding of the scope of the opportunity and what the UK can offer to address some supply gaps in the UAE. A discussion the following morning, chaired on the UK side by Lord Kakkar, took firm decisions on what now needs to happen to facilitate the right sorts of partnerships in the coming months. There will be much for Healthcare UK to follow up on. Back to the exhibition, there was one other campaign worthy of note. One of my colleagues, who was actively taking photographs during Arab Health, said with some pride on day one that he had made several round-trips from the Healthcare UK stand to the ABHI pavilion and that his smartphone was telling him that he had already clocked up 15,000 steps. This inevitably led to an internal Healthcare UK competition to see who could cover the most steps each day. You will have to tune in next time for the results, but I can confidently assert that though I may have lost on day one, days two and three were a different story (mainly because I walked to the top of the Burj Al Khalifa!). All in all, Arab Health 2015 went extremely well. However, as always, the true measure of what was achieved last week will be the level of successes that we can report on when we next meet in Dubai. Healthcare UK will be working with UK organisations and international partners to translate these into UK-UAE and UK-Gulf success stories in the coming months.